If you’re a fan who keeps an eye out on the web, you’re probably already aware of the several set photos – including some Frank Grillo who returns as the villain Crossbones – roaming around the web, second-hand footage of the teaser shown at Comic-Con and official info regarding casting decisions for characters that are making their MCU debut in this film. There is a fair amount of information out there for those excited for the third phase of the MCU, though, up until a recent tweet by Avengers star Jeremy Renner, there was no confirmation as to who would be on what side of the Cap vs. Stark conflict. In his tweet, the Hawkeye actor shared promotional art that shows character rosters for each team. The reveal isn’t technically official, since it hasn’t come from Marvel Studios itself and seems to be the result of a post by ComicBookMovies that featured the leaked images. 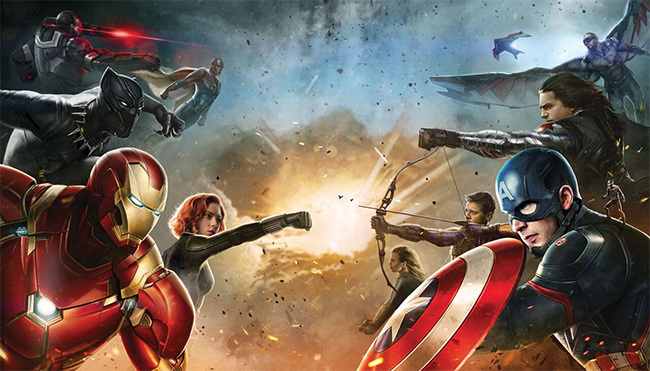 In a separate tweet, Renner also shared the following promo art showing both teams going at it. The Scarlet Witch isn’t in either of the images, which is surprising, since we know Olsen will be reprising her role in the movie. We’re guessing she might find herself occupied elsewhere before the main event. It seems Chadwick Boseman’s Black Panther will be making his MCU debut on Iron Man’s team while Paul Rudd’s Ant-Man and Emily VanCamp’s Sharon Carter (Agent 13) will be joining the Avengers’ in-house brawl on the other side. The pint-sized hero, if you haven’t spotted him yet, is on Hawkeye’s right shoulder, which hints at the duo’s popular tag-team special. Tom Holland’s Spider-Man is missing in the images, which should make sense to those familiar with Marvel Comics’ Civil War story arc. If you aren’t and don’t mind minor spoilers, here’s the gist: the wall-crawler is meant to switch sides half-way through the conflict. Though, the storyline could easily be very different considering the many differences from the Marvel Universe that the MCU already has in place, like the inclusion of Vision in Civil War. Another reason we couldn’t get a glimpse of the new Spidey is that the studio might not want the hero’s new suit to be out in the wild just yet. They’re probably going to hold off on that reveal till next year, unless it gets leaked. We’d like to be proven wrong, though.